I'm stil on hiatus but i thought i'd post something i was working on and off between my studies. 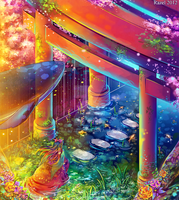 I made it extra bright for the upcoming spring over here ^U^/!!! I wanted to see how much my style has changed, aaand i think it's changed quite a bit. Dunno how much improvement is there since i wasn't able to put as much effort in this as i wanted. But i didn't really draw this to revamp the old piece, just felt like drawing it again. Though i definitley still need to work on my anatomy, b-but this time i used no ref! The brightness immediately drew me in, fantastic color usage!! Sooooo cute, lovely and colorfull! Absolutely stunning! The colors are so gorgeous~! I'm officially in love with your work! I love those vibrant colours! And that pic is awesomelly improved! Your paint style is very distinctive. Ok what i don't like about the pick is the hair colur the hair style or the frilly bits on the dress but i'm not a huge fan of pink, curls like that or frills so that's all personal to me but it works with the rest of the pic. What i do like is everything else about the pic she seems to fit into it well the eyes even though lots of colours are slightly duller so it works kinda well i think it's a really good picture not my fave but i like it none the less. Kinda a have a Mario feel to it! Same goes for your older one in my opinion of the above. Oh my...! Such vibrant colours! What a beautiful character! O_O I love the colors. omgosh the colours are so vibrant lovely work "claps"
Her hair is gorgeous. omg. I love her cute wings too! *U* <33 so much detail. omg. I immediately thought of "hidden garden"! ;3; It's just so magnificent!! I love both so much. the blue sky is soo lovely!! i definately like this one better. I think the colors look great a little darker. you can definately see your improvement as an artist. You added more advanced techniques in this one like the movement in the bottom of her skirt. i also think that the proportions of her face and body are much more accurate in this one rather than the first. APLS;ALSALSALSAL;SLA;SLA I remember this LOLZ *wasstalkingyouandIfoundthisLOLZ*/SHOT. I love the colours and I can tell you had a lot of fun working on this *touches* . Good luck with your studies Pat-chan *knowyoucandoitifyousetyourmindonit* . Beautiful colors and light's work. I love the outfit especially C: Great work.